This world, as we know, is a fragile and fallible place, in which we encounter hunger, disease, sickness and death. Jesus proclaims, by his actions of healing, that there is another world, the Kingdom of God, which will be free from all such anxieties and afflictions. The story of Paradise and the Garden of Eden painted a picture of a world which was perfect, and free from all problems. Jesus came into the world precisely to offer us a return to Eden, if we follow him. Each of his miracles is also, in some sense, a parable or teaching, pointing out to us something of the lost happiness and perfection which he is restoring. This vision of Paradise is not Utopian or delusory, not just a vain hope to comfort us with, but the true manifestation of God’s love for us. 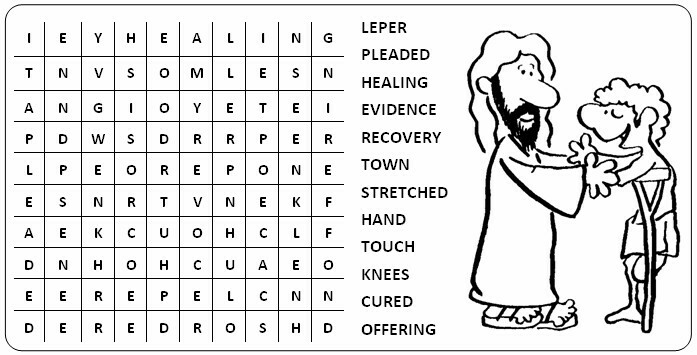 Jesus could not cure every disease or sickness in the world then: but his miracles of healing are a sign that one day, when the Kingdom comes, sickness and disease will be wiped away for ever. Each Sunday the Responsorial Psalm is always linked in meaning to the First Reading. Never is this more true than today. To read from Job and then omit or change the Psalm would be disastrous for the meaning of the readings today. Job presents us with the complaints, with the moans and grumbling of the man oppressed by everyday life. The Psalm responds by pointing to God, whose love is so complete he heals all our ills. It’s amazing how, even though the book of Job was written so many centuries ago, there is a very ‘contemporary feel to his list of complaints: this should make it easier for the reader and for the congregation to understand. This is a slow reflective reading - it’s the questions asked in the darkness of the night. Be careful with the language in places: “months of delusion I have assigned to me” is a fine poetic phrase, but a little difficult to read - but in this reading colour and tone are (in a sense) more important than “understanding” the words. Second Reading: 1 Corinthians 9:16-23. Paul offers a very personal reflection on his mission, and how he has set about it. For Paul, the most important thing in the world is the Gospel. He can no more ignore the Gospel than he can stop breathing! In reading, there must be a sense of the excitement and enthusiasm Paul brings to his mission - and also the sense that he is utterly driven by it. Be careful with the emphasis in the first sentence: it’s not “I do not boast of preaching the Gospel...” but rather “I do not boast of preaching...”Paul has nothing to boast about, because the Gospel is his life and his duty. There is a rhetorical question half way through (“Do you know what my reward is?”) As always with such questions, leave a momentary pause, so that the congregation can think about what the answer might be. Emphasise the phrase “...at any cost.” This tells us so much about Saint Paul, and what his mission was. 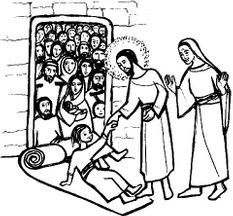 "He cured many who suffered from diseases of one kind or another."